Sherri Goren Slovin, a Cincinnati divorce lawyer, will never forget the day she appeared in court to represent the devastated mother of a 14-year-old girl who had committed suicide with her father’s gun. The father had filed a motion for reimbursement of funeral expenses. Once upon a time, Slovin litigated many of her cases. But often she found that when she thought she had “won,” the bitterness of the trial endured and post-divorce issues continued to traumatize families. She grew tired of seeing children as victims in these battles. All of the anger and hatred that is intrinsic to family law litigation made her feel that her legal abilities were being abused. Rather than helping people, she felt that she was adding to their problems. There must be a better way. Today, a significant portion of Slovin’s practice is collaborative divorce. A presentation on collaborative divorce was given at a recent Second Judicial District meeting and the concept has also been raised at chief judges’ meetings. Unlike other divorce cases, in a collaborative divorce, the parties and their attorneys work together to solve problems. There is a commitment at the beginning of the case to work towards settlement. To ensure the clients that the lawyers join in this commitment, at the beginning of the case the lawyers and the parties sign a stipulation, which is submitted to the court for entry as an order, where the lawyers contractually agree to withdraw from representation if the case goes to trial. In a collaborative divorce, there is no formal discovery. Both sides must agree to make full and voluntary disclosure. All appraisals are joint. Both attorneys refrain from attack letters and confrontational behavior. Collaborative divorce is not for every case or every attorney. It cannot work where there are allegations of hidden assets. It may not work if there is substance or alcohol abuse, domestic violence, or mental illness. However, many divorce cases involve none of the above issues. Many involve two reasonably good people who just cannot live together anymore. While anger may temporarily blind them, their long-term best interests when there are minor or adult children involved require a decent, if not amicable, relationship. Collaborative divorce requires lawyers who believe in the process and commit to work to resolve problems. Collaborative lawyers use problem solving techniques to fashion a “win-win” approach to the case, rather than the intimidation and threats of going to court to litigate. Judge Mary Howard Davidson encouraged collaborative divorces during her years on the bench in Minneapolis. Calling it “divorce with dignity,” Davidson found that collaborative divorce significantly eased the trauma of divorce on the couples who appeared in front of her without prolonging the process. In fact, she found collaborative divorces, on average, were resolved in less time than conventional ones. Today, collaborative divorce groups are operating in California, Connecticut, Georgia, Minnesota, Ohio, Pennsylvania and elsewhere. Many other states are in the process of starting groups. Although details vary from state to state, collaborative divorce has uniformly reduced the stress of divorce on parties and their attorneys. 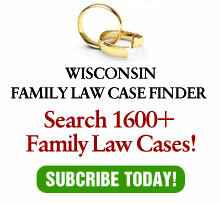 In Wisconsin, a group of lawyers has formed a private, non-profit organization called the Collaborative Family Law Council (CFLC) of Wisconsin Inc., which is dedicated to bringing collaborative divorce to Wisconsin. Chapters of the CFLC of Wisconsin have been started in southeast Wisconsin (Milwaukee, Waukesha, Ozaukee, and Washington counties), and northeast Wisconsin (Outagamie, Winnebago, and Brown counties), as well as in Dane, La Crosse, and Racine counties. Prerequisites for membership include training in collaborative divorce principals. For more information, visit the CFLC Web site. This article originally appeared in The Third Branch.